We're following that post with a series of short profiles that will collectively provide a starting point for an exploration of international blogs, online magazines, and pages. We began by looking at Kilele, We Take Pictures Too, Arab Image Foundation, Greater Middle East Photo, Space Cadet, Street Level Japan, Kantor Berita MES 56, Japan Exposures, and Invisible Photographer Asia. 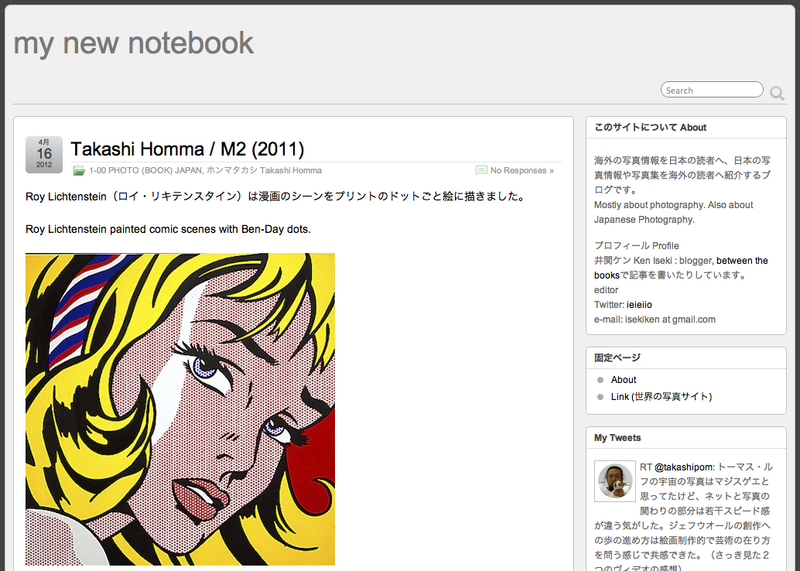 Today we return to Japan for a look at my new notebook. In a sentence: A "bridge" site that aims to introduce international photographers and photobooks to Japanese readers as well as to introduce Japanese photobooks to overseas readers. As Dan Abbe has pointed out in several articles on his site Street Level Japan, photography blog culture in Japan is at a nascent stage and much online information produced in Japan is geared for a Japanese audience. my new notebook, originally written just in Japanese but now in English as well, functions as a rare site that aims to increase the flow of information into and out of Japan. It has become one of the leading sites for the exploration of Japanese photography online. Posts lean towards photobooks, but also explore exhibitions and the photographic history of Japan and Western photography. Posts are simple and straightforward, a presentation of links, images, facts, and single sentence comments. The site serves as a way to discover new names and learn about the landscape of Japanese photography, both past and present. Along the righthand sidebar below "My Tweets" are some important boxes for site navigation that are not translated. In descending order they are: Popular Articles, Categories, and Archives. Ken Iseki can be followed on Twitter here - although he forewarns 90% of his tweets are in Japanese.